The inspiration behind naming the houses like this is the philosophy laid in the Indian scriptures that all forms of life comprise the five natural elements (Panch Mahabhuta Tatwa) Agni, Jal, Vayu, Prithvi and Akash. These five elements combine together to create a balance in nature which ultimately helps in the creation and sustenance of life. The five natural elements - the life elements, have been described in totality as one complete unit. 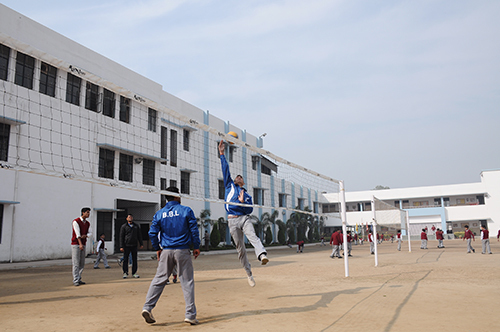 Four houses offer platforms to the students to struggle, compete and to win. They apparently seem to be different but they are one complete integral unit of BBL to ensure a perfect coherence. 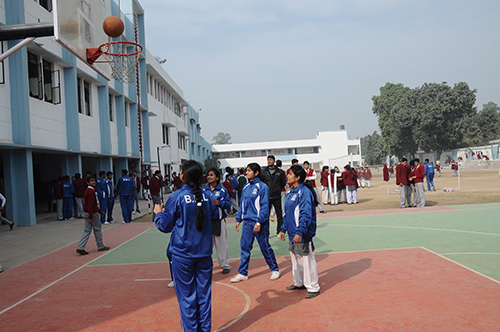 Keeping in view the age and class of students, a set of activities is very judiciously prepared. Students are informed in the beginning of the session so that they participate with a fine preparation. They prepare themselves accordingly and participate full swing. These activities are put to practice on each available Saturday in the last two periods. A team of judges adjudge the top three students for first, second and third slots. Each winner student is facilitated with participation certificate and the marks thus gained are added to the house score he/she belongs to. 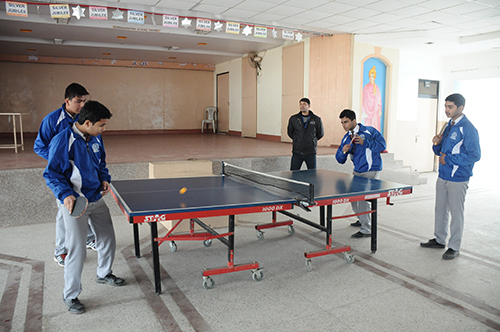 This is how the students contribute marks to their respective houses to help it lift the House Winners or Runners up trophy towards the end of the session. The scheduled Saturday activities include a vast variety. Quiz like Heritage Quiz, Science, Maths, English quiz etc. and different dance forms , extempore, debate, paper folding and paper jewellery, Sudoku, collage making and many more. Agni is the most sacred of physical forces and is capable of purifying any substance into a more refined form. In terms of human senses the Agni element corresponds to the most important of the senses that of 'Roopa' or sight. Sun, the primary source of life and energy is also with this element. Agni is the Fire God. It represents light, energy, enthusiasm, order, passion and spirited vigor. It's nature is hot, dry, luminous, clear, light and piercing. It stands for energy, productivity and power. The sound of Agni is high pitched. It is heard in the falling of thunderbolts and in volcanic eruption. The colour of Agni House Flag is RED - the colour of strength, health and vitality. The red are those who determine to get all they can out of life. They are optimistic and can not stand monotony. Reds are folks with open and uncomplicated nature with zest for life. Jal is the largest of all elements as more than 80% of our body and two third of earth's surface is made up of Jal. It is essential for the existence of all life forms. signifies transitory emotions, surface feeling and business dealing. It is associated with movement and represents prosperity. It's nature is liquid, cold, soft, exciting and moving. It stands for purity. The colour of Jal House flag is BLUE. It is the colour of deliberation and duty. Blues are soft, soothing, compassionate and caring group.. They are admired for their steady character and wisdom. The ever restless element of air is often referred to as the "breath of Purusha", in the ancient Vedas. It is associated with Vayu - the Wind God. It is the fundamental element for our survival and thus as life supporting element, Vayu is very powerful life source. It's nature is transparency, cold, dry, restless and intellectual. It stands for pervasiveness and movement. The sound of Vayu is wavering. It's voice is heard in storms, in the whisper of moving breeze. The Vayu sounds overpower all other sounds for it is living and in every aspect its influence produces ecstasy. Vayu's House Flag colour is YELLOW which reflects happiness, wisdom and imagination.. Those who are mentally adventurous, searching for novelty and self fulfillment choose yellow colour.. These folks are usually clear and precise thinkers having lofty ideals. Prithvi is the only element that is connected to all the five senses of the human body - the sense of taste, touch, sound, smell and sight. This is the reason why it influences us the most. Prithvi has been personified as a deity, in particular a goddess. In many cultures the Mother Goddess is also portrayed as a fertility deity. Prithvi by nature is heavy, rough, dense, hard and inset. It stands for stability of mind and body and health of inhabitants. Prithvi has various aspects of beauty as well as variety in its sound. The sound of Prithvi is dim and dull and produces a thrill, activity and movement in the body. The colour of Prithvi House Flag is GREEN which stands for harmony and balance. It symbolizes hope, renewal and peace. Greens are generally frank, refined and civilized.